While the party began hoisting the corpses out of the way, they split a group up to keep watch in both directions. One of the groups was attacked by a flock of stirges attracted by all the noise of the group moving the spider corpses, but they quickly drove them off. After moving the corpses, they looted the nest. The most interesting thing they found was a sword with magic script written across the blade. No one wanted to cast ‘Read Magic’. Rage Claw agreed to carry it and they divided up the rest of the treasure. Moving cautiously down the main tunnel they reached another four-way ‘X’ shaped cross of passages. Journeying down both legs of the passages they found more tunnel and more bones, but they both ended after about forty or fifty feet. Still, the excess of bones was leaving the party feeling very uncomfortable. Travelling further, they reached what appeared to be the end of the large corridor, another octagonal room. Ragged tapestries hang on the walls, so faded and moth-eaten they could not tell what the tapestry originally depicted. However, unlike the previous one with the Imperial statue, this room had a five-foot tall platform upon which stood a silver cage. Inside the cage was a strange seven or eight foot tall creature. It appeared to be some manner of exoskeleton with a honeycomb of passages and air holes, inside of which was a greenish-brown plant mass. The sound of the whistling trees was definitely coming from the creature. It didn’t move until the light bearers entered the room, at which point it became agitated and hostile, stretching it’s massive limbs through the bars of the cage for the light. There was some discussion and then Kenan-Tal pulled out the little totem bull-roarer necklace and began spinning it. The creature became quiescent and backed away from Kenan-Tal. Whenever they stopped spinning the totem, the creature immediately became agitated. They searched the platform and Grimnor found a loose stone, behind which was a keyhole. Not having found a key, they put the stone back. The general consensus was that no matter what, they didn’t want anything bad to happen to this creature, even if it didn’t seem too happy with them. There was a narrow passage leading north out of the room, so Rage Claw and Grimnor went to check it out. The first door they kicked open but the room appeared empty so they left it and went to the next one and booted it open. Again, it appeared empty, so they turned back to get the rest of the party before they separated too much. 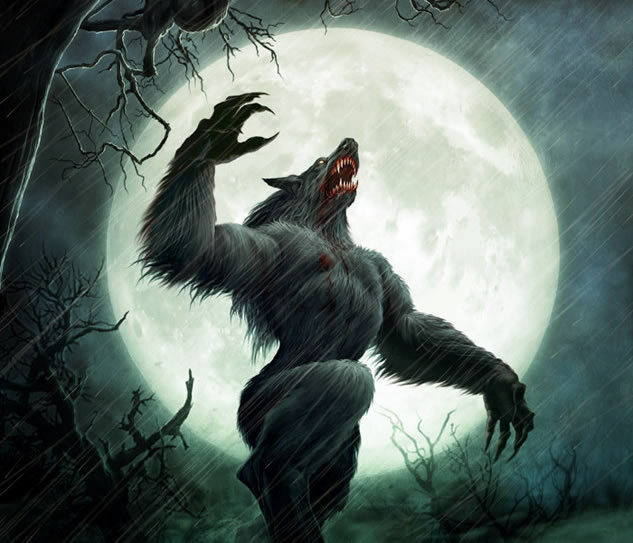 As they headed away, a large fur covered beast with the head of a wolf but walking like a man roared as it flew out of the room and attacked Rage Claw. Grimnor and Rage Claw saw a smaller furry humanoid run out of the room, up the northern passage and disappear around the corner. The two large monstrous warriors began to lock limbs. The rest of the party called for Rage Claw to retreat into the room so they could surround the ravening monster. But Rage Claw kept trying to knock the creature down. For three rounds… but due to bad rolls on his part, and good saving throws of mine, he never managed to knock the savage beast down. Meanwhile it kept cutting him with its claws. Finally, he managed to throw the wolf-man to the ground, and then ran back down the tunnel. The creature snarled and leapt to its feet and then gave chase. Dar, who’d fired both of his silver arrows at the thing, fired a normal arrow and buried it in the creature’s eye. It knocked the arrow away and come coming. These guys + cleave will mess you up! Rage Claw saw the eye immediately regrow, filling back in the bloodied socket as though nothing had ever happened. Howling, the seven-foot tall monster barreled into the party. As it came out, it ran into the walls of spears the party had prepared for it. It roared with pain, but ignored the attacks. The party watched in horror as the wounds rapidly closed. With swipes of claws and biting fangs, it dropped one of the lizardmen. Rage Claw drew the unidentified magic blade and swung, but the creature knocked aside the blow. Lilith doused it in oil while it tore into one of the other lizard men. It fell before the savagery of the wolf-creature. Rage Claw swung and connected with the sword and found it was truly magical. Blood sprayed across the ground and this time, the wound didn’t heal. Anika wove her hand in an arcane mudra and a spray of sparking lights descended upon the monster. It immediately collapsed, floored like a ton of bricks. Rage Claw swung the magic sword and decapitated the monster. Before the head stopped rolling across the floor, it had turned into a severed human head. The healers tended to the lizardmen, finding them both mortally wounded. One had lost an eye and the other would, if it recovered, suffer brain damage. They cast their last healing spells to restore the creatures, but they will still need weeks to recuperate. We ended the game there. The party uncertain as to whether to continue forward or turn back and try to rest. Based on the map, they think that there is not much left of the dungeon, but they don’t know what they might encounter before everything is finished. This entry was posted in Ahlyen, Geek, Play Report, Role-Playing, Sundered Empires and tagged Advanced Dungeons & Dragons, Adventure Conqueror King, Ahlyen, B/X, bones, catacomb, catacombs, Dalagar, Dungeons & Dragons, Goblin, Lilith, lizard men, lycanthrope, Mage, Micah Blackburn, Old School, OSR, Otho, Play Report, Rage Claw, roleplaying, skeleton, Sundered Empires, The Lichway, undead, werewolf, wizard.